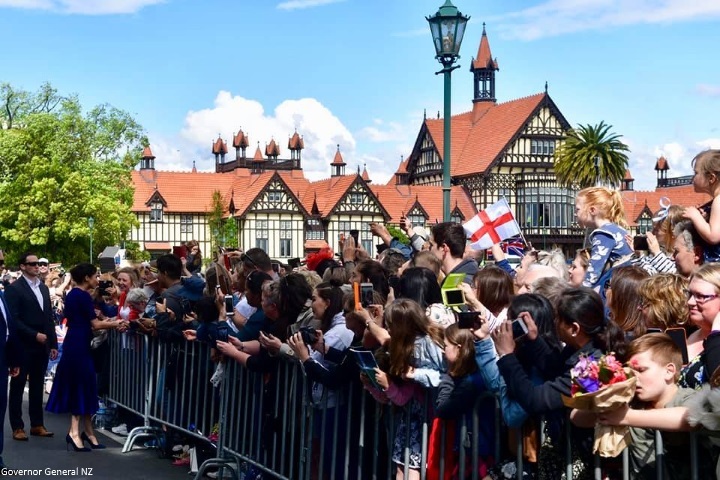 Mad About Meghan: "It's Been Great": The Royal Tour Concludes in Rotorua! "It's Been Great": The Royal Tour Concludes in Rotorua! 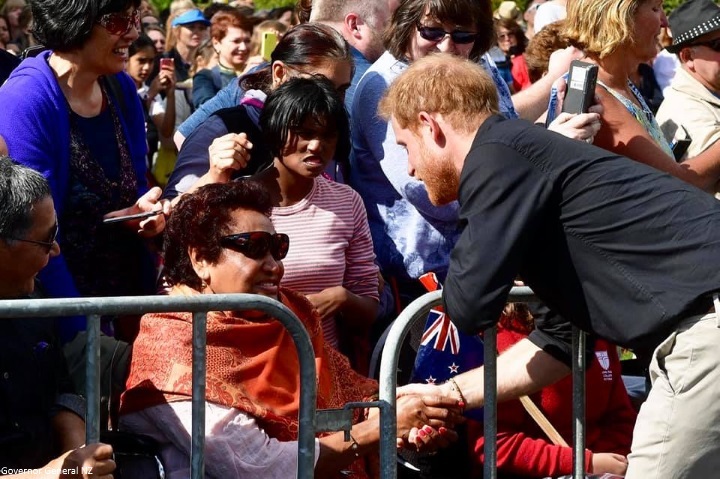 The Duke and Duchess of Sussex's sixteen-day Autumn tour of Australia, Fiji, Tonga and New Zealand came to a close this afternoon with engagements in Rotorua. The Duke and Duchess visited Rainbow Springs to learn more about the centre’s kiwi breeding programme. 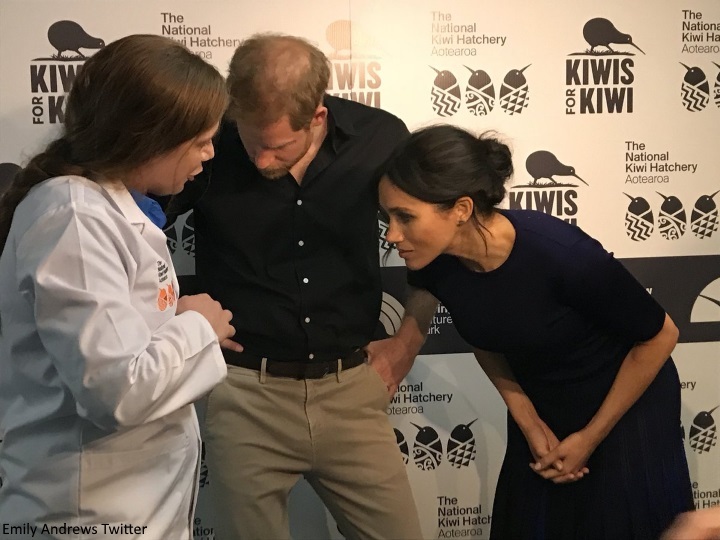 Kiwi, which are New Zealand’s national bird, have become increasingly endangered in recent years, and Harry and Meghan had the opportunity to meet conservationists working to protect the species. The couple met two adorable chicks. 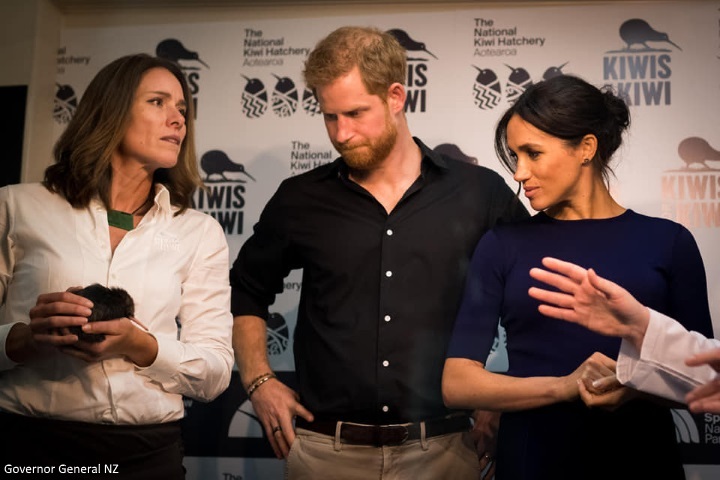 The New Zealand Herald reports: "Guided by Kiwis for Kiwi's Michelle Impey and Rainbow Springs husbandry manager Emma Bean, the royal couple went behind the scenes of the hatchery - where a kiwi chick hatched just minutes before their arrival. The couple named the three-day old chicks, from Coromandel and Taranaki, Koha (meaning gift) and Tihei, from the Maori saying 'tihei mauriora' meaning 'the sneeze of life'." In 1929 a young man named Ted Bruce moved from Fielding to Rotorua, purchased a run-down dairy farm, covered in swampy ground and really not much use for anything. 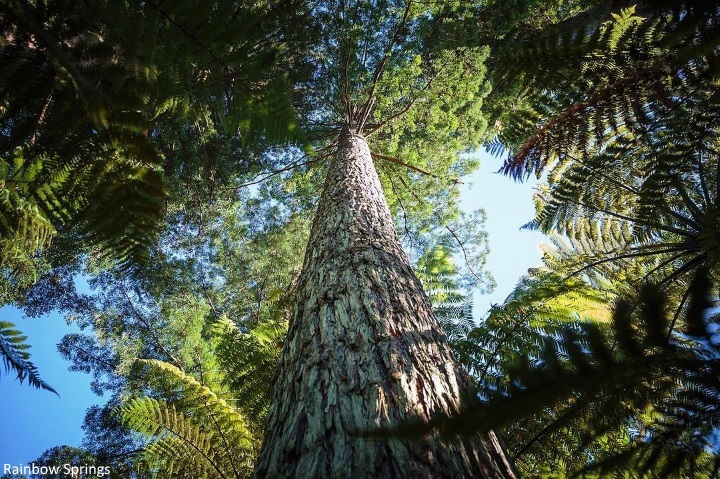 Ted must have seen something in that land though, because almost 90 years on, Rainbow Springs is one of the premier tourism attractions in Rotorua, welcoming thousands of guests each year. Between 1929 and 1932, Ted set about creating his vision on Rainbow Springs, building cabins, a campground and caravan park. He then started capturing the spring water that was erupting from the ground, forming the first pool - the Rainbow Pool, which flows for 2.5km, via a fish ladder into Lake Rotorua. Trout from the Fairy Springs creek were netted and transferred to the new pool. The Duke and Duchess headed into the city for a walkabout to meet members of the public. Meeting as many people as possible was a key objective for this tour. Harry and Meghan certainly achieved the goal spending as long as possible chatting with locals at every stop. A sea of well-wishers lined the area. Reporters said thousands turned out. The Duchess was immediately taken with two-year-old Catalina Rivera. She got through the barriers and held Meghan's hand as she did a little dance. Meghan hugged the little girl much to the delight of the screaming crowds. Prince Harry chatting with the crowd. Meghan meeting a little boy. 'Those spoken to said the wait had been worth it. Grace Collins, 18, said she didn't mind waiting three hours. "Oh my god, she is gorgeous," referring to Meghan. Four young boys got the best spot up a tree, right next to the crowd barriers. One of them, DJ Katia, said he had been waiting up the tree for just over an hour. His mum, Trudy, said it was a great idea, although he ended up getting a better view than her. Janine Colenso from Rotorua presented Meghan with a framed miniature korowai intended for Meghan and Harry's baby. She said it is tradition to give the first one you make away. She was hopeful Meghan would take it and her eyes lit up when she walked past her, stopped and took the gift. Sophia, Lily, Charlotte and Sophie from Ngakuru were ecstatic when Harry took their traditional NZ Buzzy Bees which they had wanted to give them for their Christmas tree. Rotorua royal watcher Barry Jenkins said it was incredible. "It is a great day." Debbie Whare and Reta Mutua had been waiting since 10am and had a fluffy kiwi toy to give Meghan and Harry. "We hope they take it for their baby." They were thrilled when Meghan took the stuffed toy. Carey Bryant went along at 2.30pm with her friends and although didn't get a great spot, being three rows back, still managed to have her hand shaken by Prince Harry. "I will never wash my hands again." Alison and Axel, 6, King got to talk to Harry after the prince spotted Axel's Heads Together charity headband. Alison, who is English but now lives in Rotorua, said he charity was formed by Harry with William and Kate. "It was the London Marathon official charity last year when I ran it and we all got the headbands in our race packs. Harry said 'where did you get that?'. "He asked me where we were from, if I ran the marathon and if I stole it from the charity," she laughed. "Axel claimed it as soon as he saw it so I knew that's what he should wear today to get his attention." A video from the walkabout. 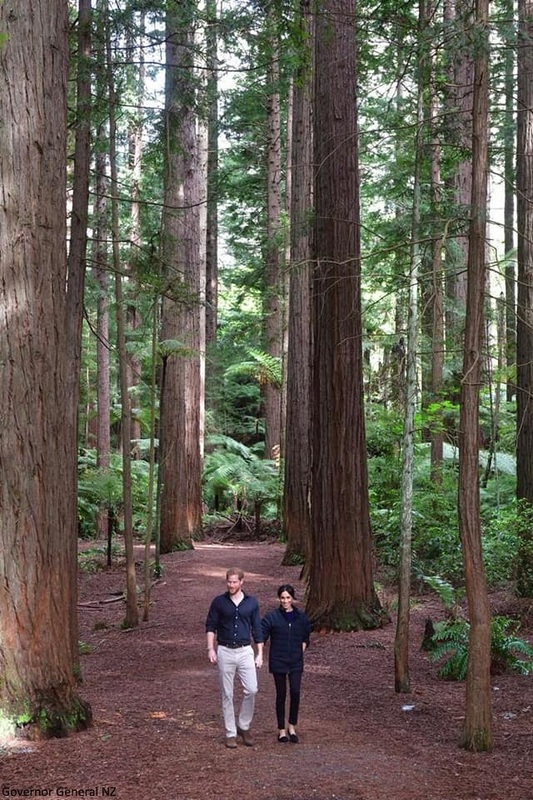 For their final engagement of the tour, it was a quick change for a visit to Redwoods Treewalk Rotorua. A great shot of Harry and Meghan. 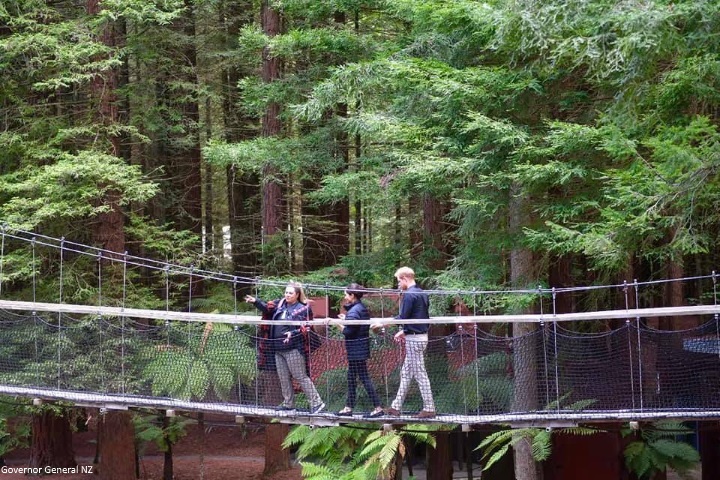 The treewalk is a 700m-long walkway of suspension bridges between 117-year-old Redwood trees. The forest is also the home to a thriving mountain biking community that draws people of all ages to the Redwoods. 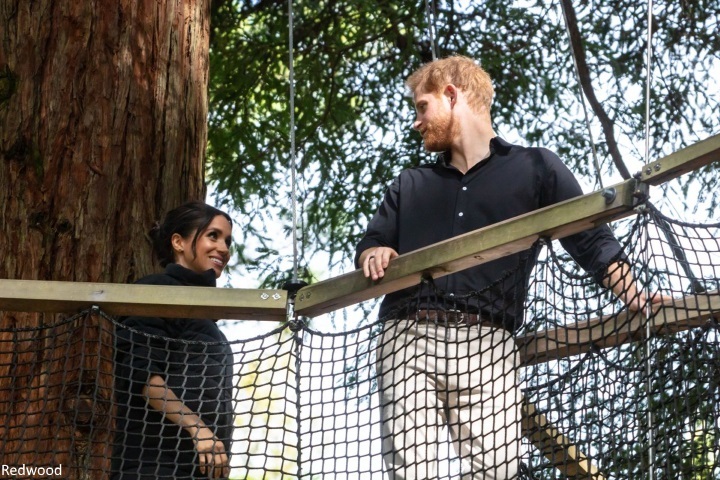 The Duke and Duchess learned about the forest’s history and took on the tree walk. As they made their way back to the car, Harry turned to the reporters and said "It's been great. Thank you". Meghan looked elegant in a gorgeous ensemble by Givenchy. A fitted crew neck sweater was teamed with a multi-toned pleated skirt. The shades of blue, indigo and black made for a striking combination. Clare Waight-Keller designed Meghan's wedding gown and the pair enjoyed a wonderful collaborative process. We can expect to see Givenchy in Meghan's wardrobe rotation with some frequency. Today's outfit is a very versatile one. The Duchess wore her Manolo Blahnik BB pumps in navy suede. 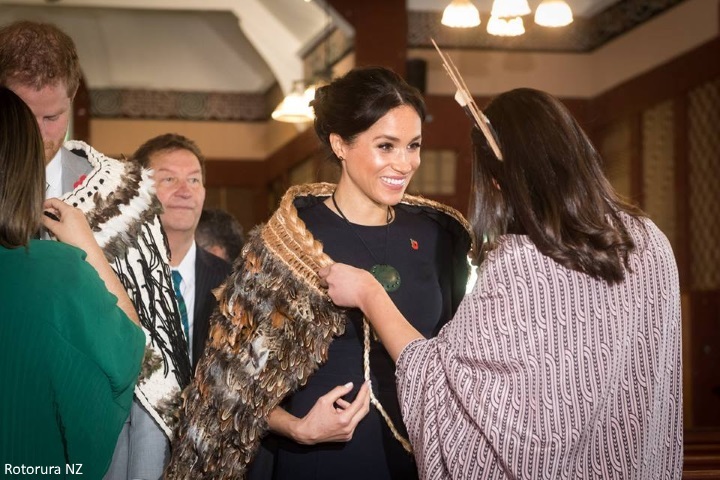 The Duchess accessorised with the Boh Runga Discologo earrings Prime Minister Jacinda Ardern gave her. 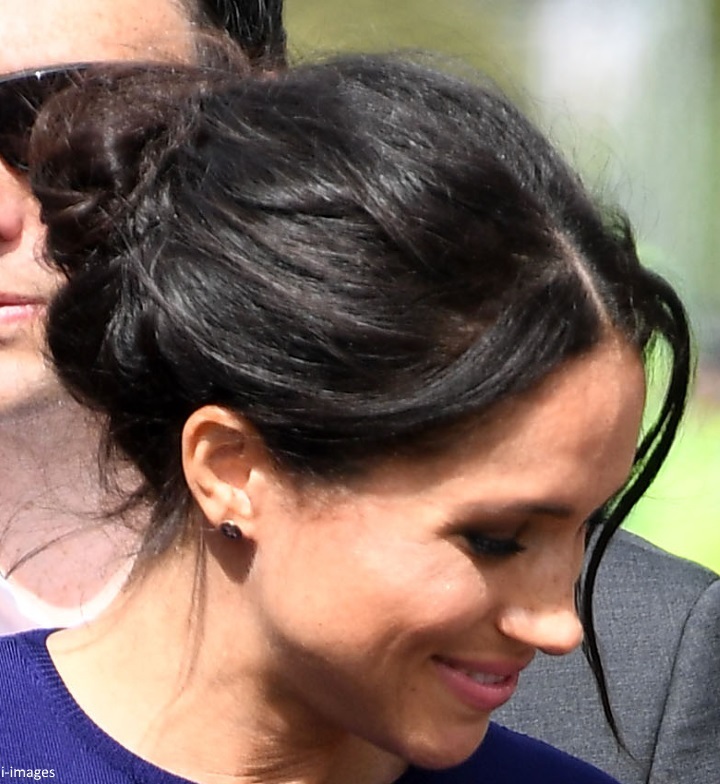 Meghan wore her hair in a very pretty updo. 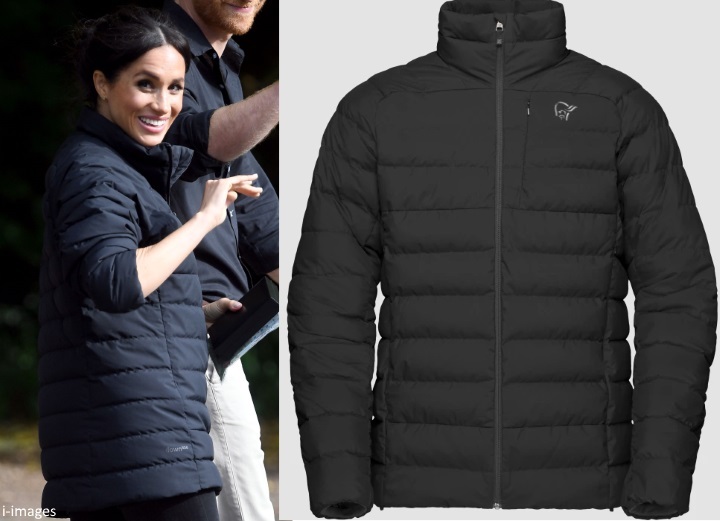 For the engagement at Redwoods, it is believed Meghan changed into Harry's Norrona Oslo Jacket (with thanks to Meghan's Mirror). 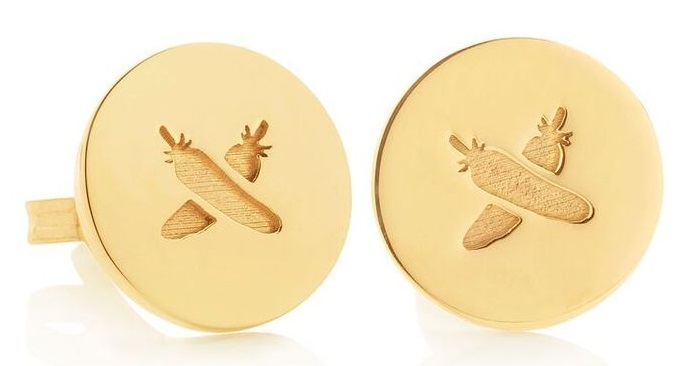 Meghan also wore her $120 Birdies Blackbird Slippers. She's had them for over two years. In case you missed it, click here to read today's earlier post. You can catch up on all the tour coverage on the Royal Tour page. Sixteen days, over 70 engagements, countless memorable encounters, special moments with the people of Australia, Fiji, Tonga and New Zealand... We've been lucky enough to experience it all from the moment Harry and Meghan landed in Sydney. The tour began on a high with the delightful news Meghan is expecting. Thanks to the dedication, tireless work ethic and warmth of the Sussexes the momentum remained throughout. At each and every stop they were greeted by thousands and memories were made. The exhausting tour was a baptism of fire for the Duchess and she excelled every day. Together, Harry and Meghan have proven themselves more than worth of the title of Commonwealth Ambassadors representing Her Majesty with aplomb. I can only imagine how pleased and proud the Queen is. It was a privilege to cover Harry and Meghan's first joint tour here on Mad About Meghan. It feels like the right time to say a heartfelt thank you to everyone who followed the tour here. Whether you're a silent reader, a longtime poster or a royalist who stopped by for the first time, it was a joy to follow it with you. I received so many supportive and kind comments, some of which spurred me on in the middle of the night when I was running on caffeine alone. I read every single comment and I'm so grateful you took the time to leave them. A special thank you to the royal reporters, fellow bloggers and photographers (especially Andrew Parsons and Stephen Lock) for their outstanding efforts keeping apace with the demanding schedule. We'll be chatting about the tour over the next week, there were so many fantastic moments and looks I would love to discuss in-depth. In the meantime, Harry and Meghan are enjoying their last evening in New Zealand. They will return to London tomorrow. I expect there's a good chance we'll see departure photos. I thought this was simply an outstanding trip. The Royal couple are so in touch with the people and make the time to see so many. The joy around them is contagious! I’m sure it’s been an eye opener for Meghan and I’m so impressed how engaged she has been for the entire trip when she must be feeling so tired. Thank you Charlotte for your wonderful coverage. Your posts are so full of research and details. I’ll miss checking here everyday but am wishing you a well deserved break. My favorite outfit of the tour. The snug top and pleated skirt is darling....I really like this look on Meghan. Thank you Charlotte. Most of the time, I am just a silent reader but now I want to express my respect for the work you have done on the blog during this tour. I appreciate it so much. They’ve been working non stop to the point where I’m even exhausted just looking at them!16 days of non stop work!!! I’m just amazed at how many people have turned out to see Harry and Meghan, some of the crowds have been in the thousands.Such a perfect royal couple!!!! I love that she apparently kept the Givenchy sweater on for the walk - really proves your words about versatility of this outfit. Thank you so incredibly much Charlotte! You did an amazing job! Your articles are some of the most enjoyable I have read, with your delicate wording, kindnes, precision and a lot of information! Thank you! What a fantastic coverage of that tour!!! You are doing a fantastic job as usual. I have been following your blog on the duchess of Cambridge for quite some time now and I could not prevent myself from going on this one too as I know how interesting and full of details your posts are. Thanks for keeping us up to date with not only fashion info but also on the events themselves. We are learning a great deal. You are such a jewel! Your tireless dedication to both this blog and the Duchess Kate blog is inspiring. You have turned both into world renowned blogs with the most in depth, best researched and well written royal blogs that I have ever had the joy and privilege to read and participate in. Both blogs, but the Duchess Kate for longer, have gotten me through tough periods in my life. The supportive and inclusive community you have created is so very special. Thank you for your time that you've invested, and all the future time you will invest, in your creations. You will never truly know the impact you have made all around the world. What a lovely thing to say, Courtney. I got a bit misty reading. Charlotte, you are ab.so.lute.ly amazing. Thank you for all your amazing work. I love the shades of blue skirt most out of all of her looks today. They both are looking tired but finished strong. I hope they have a good rest tonight and a safe trip home. Their bodies are probably just getting used to the massive time change just as it is time to leave! I've enjoyed reading everyone's comments over the last several weeks. During tours and live blogs are two of the times the blog comes alive! I agree, Courtney, and it's nice to see you over here too! Thank you so much for your brilliant coverage which captures every moment of a landmark tour ! Oh Charlotte you deserve the highest award for your magnificent coverage of this fantastic tour. I will be in withdrawal, missing checking the blog to catch up on the latest. There are no words to say how much you are appreciated and loved. What a fun time it was, and Harry and Meghan have done The Queen, themselves and their country proud. Rest and sleep now. I am also a huge Olympics fan and had just commented about similar pangs of withdrawal as when the games are over. It's been a daily joy and treat to come here and catch up on the tour after I've digested the mostly terrible news happening daily here in America. Thank you for the respite and your outstanding work, Charlotte. We couldn't be more proud of our American-born Duchess. Can't believe it's over. Well done tour. Excellent reporting by Charlotte and Team (I assume there is a Team). This has been so much fun and I feel like we're breaking up because there will be no multiple daily updates.... thank you all. Thankyou so much Charlotte. It's a wonderful blog and I m so lucky that I discovered it one day by pure coincidence. Reading your blogs was and is a joy since that. I m a silent and a faithful reader for years. You must be proud of your work here. Congratulations. It was an amazing journey with you. Thank you. Well earned rest for you now too? Thanks so much for all your work. I enjoyed anticipating your posts and thoroughly enjoyed reading them! Well Charlotte, it's been quite the ride. You did a stellar job keeping us up-to-date on all the happenings and you most certainly deserve your rest. Thank you! Since I'm one that has been vocal in the past about Meghan and all the black she wears I suppose I have no room to complain now. Counting outerwear jackets my tally is navy blue was worn 12 times. I got a little tired of all the blue but that can be shared on posts next week. :) Today's Givenchy ensemble took me back a few years. I fear Meghan looked very much like a 1960's American high school cheerleader. All she needed were saddle shoes and bobby socks (and a few inches off the skirt). Can you tell this look just didn't cut it for me? lol Looking forward to any departure photos. My vote would be for a casual look so she can be comfy and take a nice nap on that long plane ride home. Thank YOU, Charlotte! I hope by the time my comment reaches your computer, you are fast asleep, recovering from your massive blogging effort, before taking time to rest and recuperate by indulging in your favourite non-blogging activities. I really appreciate your two blogs. Thank you! Yes Charlotte so many great moments during the tour and thank you for your excellent coverage! This skirt today is striking I would love to own it but can't afford it. I like her hair and seeing her hug that little girl is adorable she obviously loves children just like Diana did. She is so genuine. I love seeing them walk through the forest must be spectacular to see in person. I am sure Meghan and Harry are very happy the tour is over and Meghan can get much needed rest but I'm sad it's over it has been such great fun. Here's hoping all goes well for Meghan during her pregnancy. 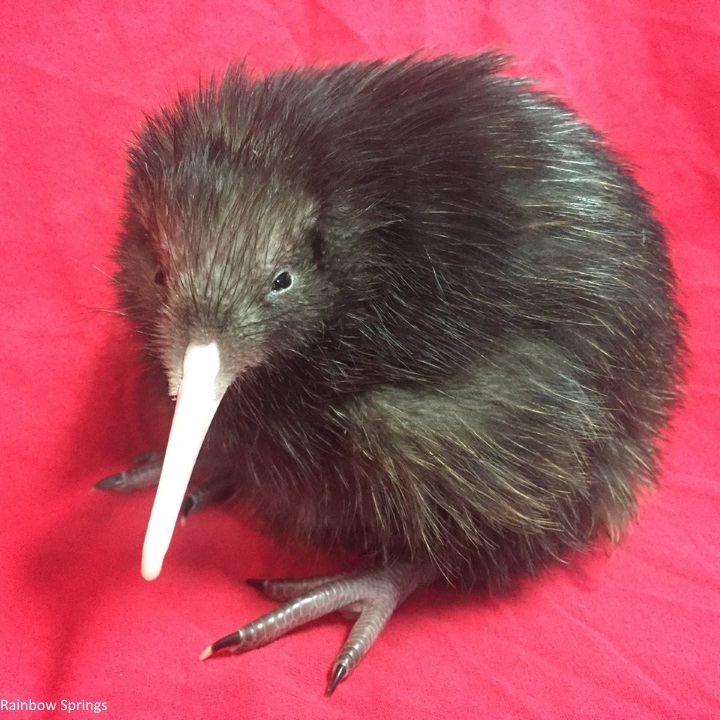 Also I'm glad to hear they brought up the issue of the endangered Kiwi. A new study says we have lost 60% of the world's wildlife already and if we don't wake up we will lose the remaining 40%! On a side note what sweater is Meghan wearing? Thanks so much for your well rounded and meaningful coverage of this wonderful tour! It’s really nice to read an intelligent blog, presenting information as it occurred & using various references, not just for your written work but also for the pictures. The Sussexes had an amazing tour. I’m very proud of them. This time last year Meghan was still working on Suits, yet now she has just completed a successful major tour with her husband. Last year, during their engagement interview, Prince Harry said he knows that he and Meghan are a fantastic team. Harry and Meghan have demonstrated that they will prepare for their work and carry out their duties like a well established and professional team. Bravo to them and their team! Charlotte, thank you so much! The countless hours you put in to this blog (plus DKB too!) are so very much appreciated! I check your blogs every morning (even without a royal tour!) and I learn so much from them. I hope that you can enjoy a much deserved rest for a few days - I think Ive almost reached saturation point just from following, so I can't imagine how you must be feeling! Oh, also, a huge thanks to the whole community here - you guys all help to make this such a great blog, and I've loved reading your comments and hearing your experiences! I’m sure we can agree that this tour has been a resounding success on so many levels! Sartorially speaking I think the Duchess has done an amazing job of presenting herself as a thoughtful and modern royal. I believe she chooses wisely when to wear clothing which is tailored and neutral and when to showcase bolder colors or patterns: a marriage of her personal style with one becoming of her new position in the royal family. I also think the conscious decision to wear regional and sustainable fashion this tour was both diplomatic and prudent. One thing that strikes me is the level of scrutiny that accompanies these two (and W & K of course) Can you imagine the sheer weight of all that? I applaud them for keeping genuine smiles on their faces and truly connecting with so many well wishers during this very busy tour. Charlotte, as one of your daily and usually silent readers, I felt compelled to comment at the close of your masterful coverage over the last two weeks. I always find your blogs to be comprehensive and insightful. You contextualize the beautiful images you present with so much detailed information that I learn something new with each post! I trust you will allow yourself time to rest and revel in your accomplishment!!! Thank you Charlotte, you have been amazing. Harry and Meghan have been wonderful and i am excited for what the future has to bring as far as these two are concerned. The fashion has been fun to watch but more so I have learned so much about Australia, New Zealand, Fiji and Tonga and can't wait for my own children to experience the same. Although I will miss reading and seeing them everyday like we have done for the past 16 days, the three of them deserve a well earned rest. Charlotte I have looked forward to this post every day. Thank you. It's really been a pleasure to follow your blog. And Meghan is really a glowing success. Harry is a lucky man; he made a wonderful choice. Thank you so much Charlotte. I've been a long-time reader of both Kate's blog and Meghan's. I rarely post a comment, but it's always a highlight to read a new post. You've done a fantastic job. Harry and Meghan are absolutely amazing to have completed this tour with such warmth and connection to everyone they interacted with. Thank you for posting such comprehensive overviews of each engagement with all the background information you include. Amazing!! OOOOOoooohh I love the skirt, the different shades of blue are gorgeous! I bet Harry and Meghan are looking forward to a quiet night and then home sweet home tomorrow woohoo! What a great tour, I am exhausted haha! I think the skirt is spectacular as well. Hope she can rewear this gorgeous outfit! Thank you for your wonderful coverage of their tour. I have no idea how you have beaten everyone else with the news and photos, but it’s greatly appreciated. Oh Charlotte this tour and your coverage has been an absolute dream. I read every post and I think every comment! Thank you for your tireless effort! I feel absolutely thrilled to have gotten to follow along and feel I know the Duke and Duchess of Sussex so much better now! As a longtime Kate fan I didn’t expect such a special place in my heart to develop for Meghan. But I truly adore her and am in awe of her stamina, authenticity and grace the past 16 days. Can you imagine how exhausted they must be???? I hope they get some well deserved R&R the next few weeks! Thank you to the lovely community who followed and posted as well—such interesting and supportive comments and no nasty or unnecessarily critical ones. I appreciate the thoughtful community you’ve created and will miss checking multiple times a day for new posts! What a great tour and come on Baby Sussex! What an exciting year it’s been and is to come! That was a very nice observation about how Meghan made a special place in your heart, honestly I am so surprised reading otherwise from anybody. I really do like this top and this skirt. Super gorgeous. Thank you so much! Your blog has really made my day on some tough work days! I love how positive you are, the coverage of the charities, and the community you’ve created! Great work and, again, THANK YOU! Just wonderful Charlotte! I have enjoyed reading every post. I absolutely love the photos, the fashion and especially the background information you provide. Harry and Meghan are a delight. This first tour for the couple, in my opinion, was an unqualified success. And as an American I’m especially proud of Meghan. She is a class act. They give me hope for the future. Thank you again Charlotte! Charlotte you have been a true champion during this tour. Thank you for all the posts. I can’t wait to go back and re-read each one. Thank you so much. Thank you Charlotte for your wonderful work over this tour. I have been obsessively tracking the events and there has been a lot of joy you have shared! Although I was truthfully left underwhelmed at times with Meghans fashion, I think she did an amazing job on this first tour especially with her speeches! Her and Harry seem to really know and have prepared for each and every stop and it really shows. Lastly, I'm just thinking, we probably won't see them for at least a couple of weeks (apart from perhaps a rememberance day balcony appearance) as they take a WELL DESERVED rest! But then I was thinking we will probably only see Meghan a handful more times before her maternity leave and for the next year (gasp!). The festive season in December and Jan is coming up and the royals tend to take time off. If the media is correct in guessing that she's due in April, she will most likely take her maternity leave in march or thereabouts which only leaves February! If she goes by Kate's pattern, she would be back from leave sometime next fall (in England). This sweater and skirt combination is so pretty and flattering for her. I’m glad they have focused so much on conservation. Birds are terribly affected by climate change. It’s important to highlight the work to help them. They have been marvelous ambassadors for Britain. What a challenging tour for the newest working royal. I think she aced it, and so did you, Charlotte. Many thanks. Charlotte, you did an amazing job. I think some of us were getting tour fatigue; can't imagine what it was like for you. I agree; they did a tremendous job representing the Queen and Britain. She need not worry with these two around. This was an incredible baptism for these two. Thank you, Charlotte, for your tireless and thorough reporting of this momentous tour. I'm thrilled for H&M as a couple, as soon-to-be parents, and as representatives of the BRF. You and they deserve a lot of rest now! So well done, Charlotte. We’re so lucky to have you! Thank you for all your work. That said, your work ethic is inspiring, and I look forward to coming here and seeing your blog. Blessings!!!! Thank you for all the posts - every engagement proved Harry and Meghan were meant to be! Loved reading of their adventures, the history of the areas visited, the cultures of the islands, and especially the great work Evictus is doing. Thank you for this insight into life as a royal. Thank you Charlotte for the great coverage! You're amazing! I hope you can get some rest now! I thought it too, I think it is the different shade of blue. On other media outlets they are calling it a see through skirt. I have seen photos where you can see that she is wearing a body suit. And it is a deliberate choice, not an accident of lighting. This Iblog is just about the only one that does not discuss that element of the design. I was startled that both this skirt and the high slit sundress were deemed acceptable attire. I'm pretty sure it is see-through. There are photos where you can clearly see the outline of her underwear. It's totally disappointing because the skirt is absolutely beautiful! If you say so, so be it. Bravo! Fantastic finish to a fantastic tour! Loved the skirt (and the kiwi) - now for some rest for the Sussexes and Charlotte! Thank u so much Charlotte, thank you for your tireless dedication to bringing us all the photos, tour updates and background research every single day for the past weeks. I look forward everyday coming to this blog! Charlotte- thanks for such a breathtaking, chock full tour!!! The Sussexes and you deserve a much deserved weekend off!!!! It takes a village to move them from place to place, and you definitely are a part of that! Whew! I could never tell when you were going to post next! Harry and Meghan should feel very proud of their accomplishment- I think the crowds were definitely appreciative of their warmth and availability. Job well done for them and their team. I think the Royal Reporters were also duly impressed and grateful that the Sussexes were so open to the media (It makes for good stories back home!). I can't describe my favorite Meghan outfit yet, but the Fijian blue caped gown is coming to the forefront! Have a safe and restful trip home Team Sussex! Charlotte, Thank you for all your posts. I have been following your blogs for years now and they never disappoint. Thank you!! You're coverage has been amazing all tour long! Is it me, or do her outfit changes seem excessive? Today, for example, why wear those 2 separate blue dresses? Why not wear one for the whole day? And on days where they flew to a new location, she would change for the departure and be wearing another outfit for the arrival. She is stunning and her outfits have been spot on, but I can't help but question why so many clothes?! I also found it a bit much and could not see the need much of the time. I find it bewildering, too, but I think there are reasons. Today, her first outfit needed to be very plain to allow the necklace and cape to be the centers of attention. The final blue outfit was rather sparkling, so it was a bit "fancier" on its own. I think the whole idea of new expensive outfits is because the public looks for them. When Kate rewears something, she's called "thrifty." Even Eugenie and Beatrice have really expensive clothes. The good news is that Meghan's clothes can be reworn because most of them are classic and have simple lines. Like Kate, these seem to be her "work" clothes and she wears ordinary items in private. when they said 16 days and 70 changes of clothes I was a bit stunned too. But as someone said on another blog it has to do with health, in a walkabout they are exposed to so many people and all their germs that the change may well include bathing just as a precaution. While it seems excessive that makes it more understandable. I believe it’s protocol to wear a new outfit for arrivals and new engagements! It’s a sign of respect! I’m sure not just her personal preference. Obviously, we do not know the reason but my guess is she wanted to make a distinction between the events she visits people she meets. But I might be totally wrong. Often the changes made sense, because the events were different. But yes, many times changing the clothes was quite pointless. For example, going from a navy dress under a beige coat to a black dress under the same beige coat, or today the two navy outfits that were the same level of formality and very similar. And the different dress getting on the plane and then a different dress getting off the plane when both dresses would have worked for both. Anett, you’re being sarcastic right? Meghan’s outfits in Australia and New Zealand have been the complete opposite from distinctive. She’s worn many nearly identical looks on several days. The 7-8 navy dresses that are basically all interchangeable, the same look with nearly identical white blazers two days in a row, wearing the same beige coat several days in a row, etc. This whole tour has been an exercise in NOT being visually distinctive. The only exception have been Fiji and Tonga, which gave us my favorite looks. Obviously the repetitiveness and sameness were planed and not accidental, so she must have a reason for it. I just don’t find any of the explanations I’ve heard people use very compelling or good PR branding. I thought the same at first, but my instinct is that the changes are specifically to differentiate the events in press coverage, so that they won't be all glossed over and melded into one long event, ex. "the charities where Megan wore the pleated blue skirt." The media already has a tendency to focus on clothes instead of the work (which, fair to them, is probably because fashion genuinely interests people and gets more clicks), so wearing different outfits might help ensure that separate articles are written for different events? And each separate cause gets more of its own spotlight? The focus on fashion is unavoidable, but wearing different clothes *might* mitigate that. Anna---I think you're right. Each event, short though it may be, should be given a symbolic importance, which can be done by a new outfit. It's a way of saying that the next group matters and is distinct from the previous group. I was not being sarcastic, and yes sometimes it made sense to change, sometimes not. Since none of us have full knowledge of her pre royal wardrobe, I would not judge her "excessive spending so closely" just yet. By the way, many times I did not care what she was wearing, I was totally lost in what she was actually doing and saying. Finally, a royal who has a voice. Agreed. She had two navy dresses with asymmetric hems (Dionne and Antonio Berardo or something). I don’t see the need for her to have changed out of the Stella McCartney dress on the last day or she could have worn the Givenchy for everything. I do think we are seeing her underwear from the flashes which is a shame I hope she gets it lined. But I have to wonder if she will rewear all these especially if they were made bigger to accommodate the bump. Wish the Birdies still came in calf hair rather than velvet. If Meghan wants to rewear these outfits & they were made with space for the bump, I am certain most, if not all, could be altered to fit after pregnancy. Making clothes smaller at the waist/hips is not nearly as much of a challenge to a seamstress as making clothes larger. Honestly, I am a bit puzzled here, why should she alter any of her dresses, she certainly can afford some maternity wear, and when she gets back into form, she can reuse her navy dresses. I have not seen this amount of concern before, sadly. It's amazing how differently we can see the same things. People were complaining about how her clothes don't fit then how tight they are. I guess I don't know what to say to that. Congratulations on a job well done! Fantastic coverage and insightful commentary. Always a pleasure to read. Now for some rest, Charlotte! Thank you a million times over for the fabulous coverage! I am awed by the work and hours that went into this! On a side note - the image that popped into my head when I read through the last of your tour blog entries was of the KP tour staff, drinks in hand, shoes off, high fiving themselves like mad. Giddy with delight at a virtually flawless effort. The thought made me smile. Thank you so much for your hard work. Truly a stunning tour that you captured so well. Just wonderful!!! I love this Givenchy outfit. Gorgeous skirt and top. Very elegant and professional. I haven't commented before, but read your blog (I'm in Florida). Thank you for the amazing coverage of the royal tour. You did a fantastic job!! Thank you so much for your coverage. I appreciate all that you've done not only with the quick updates but giving so much detail about each event. This has been a great trip and I loved Meghan's skirt in the final event. I hope she goes home and takes a well-deserved rest. She's worked hard, you've worked incredibly hard, and I will miss waking up and going straight to this site to see what events happened overnight. Thank you so much! What a great tour! Thank you, Charlotte, for your outstanding coverage of the past 16 days. I just love your blog(s)! Thank you SO much for all your work on reporting on this tour. It's been great to wake up each morning in Nova Scotia and check out your posts. (I was actually in the UK last week, and bought some pieces from Seasalt - funny to see Meghan wear their jacket a few days later). I think it was an unbelievable tour. I expect we won't see either Harry or Meghan for a few weeks as they recuperate. Again, thanks. Your detailed coverage was just great! Charlotte, you could be covering events for a national publication your work is so professional and commentary so educational and inviting for the reader. However, do not let anyone swipe you away from us. YOU, have made this tour so enjoyable for all of us. The fact that you are covering H&M and there individual tour style will be a new royal standard regardless of the position other royals are in or aspire to. I've got my pitchfork ready in case Charlotte even thinks of dumping us! Thank you, Kiwi Gal. Get behind me if it comes to it! I am afraid Givenchy dropped the ball with this skirt. The idea is great but the execution not so great. How did nobody realise that outside in sunlight the panels would become see through? I am fairly certain Meghan was not aware of the fact. And all they had to do was add a lining. I expects more from Givenchy. Thank you! I couldn't believe as I read through these comments that this was not mentioned. The skirt is completely see through. How could Givenchy or anyone associated with this tour not notice this? A slip would go a long way here. I expect everyone associated with planning the wardrobe for this tour, including Meghan, to pay more attention to these things when they know they will be filmed and photographed from every angle. I agree. How did her staff miss this even if the designer didn't care? Hello! magazine has several photos that show just how transparent it was--so much so that I thought at first it was fake. The DM is Camilla friendly. She has reportedly given them "exclusive" interviews. I suspect in return for considerations. That's how it usually works in celebrity/press interaction.Charles and Camilla have made no secret of their support for Meghan. Also, the reaction from BP might play into this exculpatory explanation on DM's part. However,words are one thing but a picture- something else. Pictures speak louder than words. Some DM readers admit they go there only for the photos. I even wonder how many read the words?It wasn't the paps chasing Diana and her sons on vacation that was harshly criticized by some media forums but their taking of photos of a dying Diana. That crossed the line. I have not seen these Meghan photos. I would think, from the description of them ,that taking such photos of a pregnant princess would cross several lines. I assume they ran photos of this incident and the fact that the DM published a story about it is still giving it publicity, despite kindly explanations. I think it is rude to take such photos as have been described here. It wasn't an unfortunate "Diana moment" to me. I think it was an unfortunate media moment. As long as we keep clicking on, reading, and commenting on these stories they will keep coming. Each one of us bears a responsibility for bringing fairness and decency to on-line and print coverage. The ones making a profit from unfairness and indecency won't. Forgive me for this personal comment-if I were Charlotte I would feel like I'd been sucker punched. The effort she put into this tour--to end like this. But she covered the "see through" remarks anyway. That says something. Or this is the actual design of the dress and everyone knows it? I don’t think it’s an oversight to be honest. I think it’s dancer inspired. The underwear is part of a bodysuit that’s part of the skirt. Like a leotard. And I think she looks beautiful and I don’t think a woman’s thigh glimpsed through sheer fabric will be the downfall of the monarchy. Problem is Meghan isn't a dancer. If that happened to me at work, never mind on a public stage, I would be horrified. The skirt is lovely, but she has more than enough people around her that this shouldn't happen. I started reading the Daily mail out of curiosity and it is generally snarky but not specifically against Meghan at all. The unmoderated readers comments are definitely against Meghan, many against the RF, and all of them against the cost of it. I just can't believe this is being excused by some. It's a see through dress. It was inappropriate. She was in a public place doing a public event at the time. It isn't like she was being chased by photographers or enjoying a private day out. There is no excuse for this. @briggs. Of course she’s not. Ie rhe phrase dancer-inspired. Most designer clothes are inspired by something. It’s a blend of functional and being artistically inspired by something in the design sense. That’s all this skirt is. I’m guess I’m weird but I’m kind of shocked it’s causing so much pearl clutching. It’s a skirt over a body suit. As designed. Women’s bodies and legs are not controversial. @ Anonymous - I'm no prude, but you can see her undergarments/bodysuit. I'm sorry, but that's not professional for what Meghan is doing. I think she is a wonderful human being and I expect great things from her. We shouldn't even be discussing this mishap because it shouldn't have happened. I understood what you meant by dancer-inspired. I was just trying to point out that just because a piece of clothing is out there doesn't mean it's appropriate for the occasion/person wearing it. Just because I like something doesn't mean it's appropriate for me to wear to work. 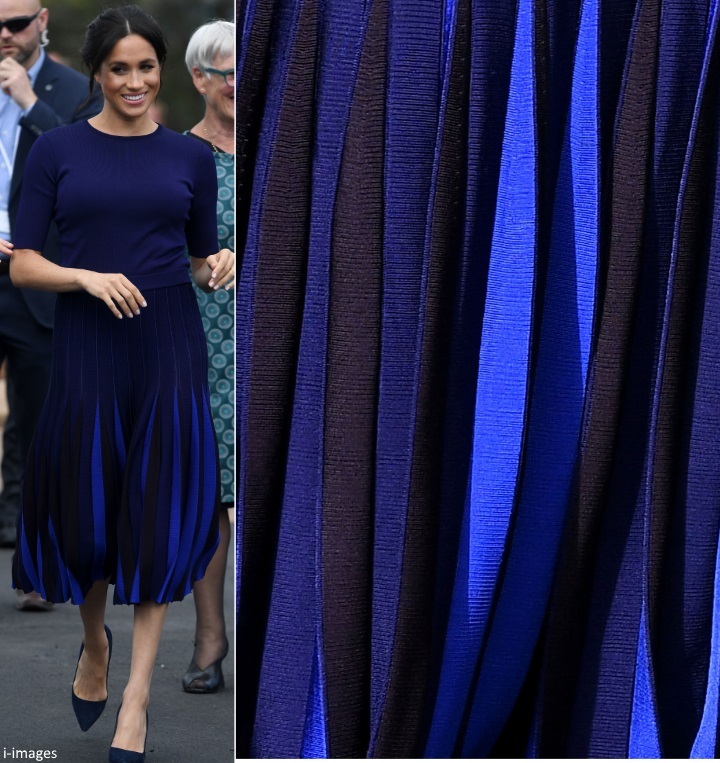 When I first saw these pics, I actually gasped - the "royal" blue is just stunning. I initially thought it was my favourite look of the tour - but then I realized that her skirt is see-through! (Lots of other images show Meghan's black briefs in clear view). She needs a slip underneath - what a faux pas on the part of her stylists. In this case, they definitely let her down. However - wardrobe malfunctions aside, she has really impressed me on this tour. She is definitely a major asset to the royal family and I hope she gets some much-deserved rest after this tour! Thanks for all of your fantastic coverage, Charlotte! So sweet--I couldn't help but think about the California girl back amongst the Redwoods! Even though the forests of giant trees are more prevalent in NorCal, that set of pictures seemed like a beautiful full circle journey for Meghan. Her Givenchy ensemble is crackling with beautiful design ingenuity, but I'm more drawn to the treewalk story. What we all wouldn't give for her own blog post about that experience?! Thank you so much, Charlotte, for covering a fantastic tour. I'm always in awe of your superhuman coverage, but I'm more impressed than ever by your efforts for Meghan and Harry's time down under. I read every post! Meghan is an astonishingly talented and brilliant individual, and her superlative efforts have already touched so many people--including all of us, of course! Thank you Charlotte! This tour has been amazing, and your coverage and attention to detail has been even more amazing. I don't comment a lot, but I read both your blogs regularly. Thanks again! Thank you so much for your fantastic coverage of the tour; You did an amazing job! I so enjoyed following along every day. I am a regular reader of your blog and love it. :) Hope you are able to catch up on sleep. I really enjoy your blog and am grateful for its content. Thank you so much Charlotte for your great coverage of the tour. I have been here at least once or twice each day, and have enjoyed your writing and photos immensely. I’m actually feel a little emotional over the end of the tour! It’s been great getting to follow them each day. And Charlotte — you are a queen! Thank you for your tireless effort and coverage! I love your blogs and am so happy to have been able to follow and comment with everyone. This has been great tour!Thank you Charlotte for all of the awesome hard work you've put it. You must be exhausted and i hope your other half treated you kindly AND kept the coffee/tea pot going! My favorite look on her by far from the tour!!! I think so, also. Regardless of the see-through aspect in the sunlight, it really is a gorgeous ensemble. Such rich, shades of blue - stunning! I have those Birdies! They are soo comfortable, I absolutely love them. I wouldn't be surprised if she has several pairs (the fir outside does get worn down fairly quickly) and wears them a lot in her private life. They are such a treat to slip on after a long day in heels. Also, Charlotte, thank you so much for your amazing coverage of the tour. I always appreciate your prompt, thorough and quality posts. The atmosphere you've fostered here is so positive and respectful; yours is the only resource I consult for info on the royal ladies! Thank you for rising above and creating excellence! Thank you Charlotte. I’ve been a long time follower of your Kate blog and came over to this one. You do an extraordinary job I love your researched posts on the events. I bet you never thought you’ve be a full time blogger but I’m glad you are. This outfit is a HIUGE miss for me. She is pushing the Royal famiky forward with the hugging, the selfies, the holding hands. But there is a limit. The skirt is see through. I like the color and cut but a Duchess should not wear a see through skirt. Ever. I’m enjoying the skirt. It’s different and definitely a conversation piece. The RedWoods Treewalk, I would simply adore. The trees, the birds, nature; I would enjoy it all. Thanks a million times Charlotte. I have enjoyed this tour. Your closing comments are touching and add a special element to all the postings of this tour. I miss them already, but feel like we really got to know them better during the tour. And I am realizing that on all of their outings in the last 4 months, give or take a few weeks, Meghan was pregnant and they knew but we didn't. I also love that there is very very little criticism here except for personal opinions on what she wears. Charlotte, in solidarity with all your hard work at all hours, I took a little nap today! It was pointed out on instagram that Meghan's Oslo jacket today is actually Harry's! He wore it two days ago for Abel Tasman I believe (correct me if I am wrong). Charlotte; could you take a look into this? If that is truth then I really cannot handle how cute and normal they are. Merci! I understood enough to get the gist of what you say. Thank you for commenting in French! What a tour! I've followed along each day, anticipating the splendor of this magical couple. It's been decades since the royal family has had a member with this much warmth, sophistication, and style. Harry hit the jackpot with Meghan. She's beautiful, warm, loving, affectionate, well-spoken, confident, and a style maven! She's so like Diana, Harry's mother. Harry himself is so charming. Diana needn't have worried about this son - he's the bomb. And of my, did he choose well for a spouse/partner. Meghan is the best thing to happen to the Royal Family in decades! I just love them. I believe Meghan has replace Amal Clooney as my favorite style maven. She gets it right every single time. Even when she wears colors, she for the most part avoids those ugly pastels. I think the reason I like her style so much is because she wears the colors of my capsule wardrobe - black, grey, white, occasional blue, occasional mustard. They had a wonderful tour, and the world loves them. Harry is so normal and not stilted, and so too Meghan. I wish them all the happiness in the universe, because they are simply adorable. I now enjoy watching the royal family, because there is a role model for everyone. Young and old alike. There are so many outfits that Meghan wore that are smashing. There were only a few outfits that were meh for me, mostly the bright colors, which are horrible in my opinion. But....to each their own. She has a flair for style, and I'm absolutely loving it! What a refreshing new member of the family. She makes it worth paying attention. Thank you for posting fabulous posts, covering this tour. I look forward to the discussions. And I also look forward to following this hip, cool, smashing couple. I have liked all of the pleated skirts and dresses that the Duchess has worn, including the forest green skirt in Ireland, the Club Monaco color block-skirt at the wedding, and especially the olive green Brandon Maxwell dress early in this tour. This dual-tone pleated skirt is my favorite. I hope we see them all again. Charlotte I'm going to agree with all the posts. How amazing your coverage has been. As a black American I am so proud of Meghan. She is like a lot of people I know who are both in my family and friends. Classy and accomplished. As for Harry, he and William are the same ages as my sons (I have one more son) and I was an admirer of Princess Diana. We got married around the same times and had my sons around the same time as well so Diana was my friend in my head and the boys are my sons in my head :0. I wish I had known about this blog before now by I am now an avid fan. Thank you so much for your tireless and unbiased coverage. What a break from what we Americans have been dealing with lately. You are amazing. Get some rest girl!!! That’s so sweet! I feel like Diana’s boys & their spouses are friends/family in my head lol As we’re all around the same age group & they’re so warm & engaging - you can’t help but feel an attachment to them. Meghan is incredibly classy and accomplished. But what also struck me was how sincere and "real" she is, and I base that on her friends. I have the utmost respect for Serena Williams, and the fact that they are so close speaks volumes. And her mom, Doria---based on who went to the wedding, I have to assume that Doria is rather alone. The other side of the family has brother and sister hating each other, children disowning their parents, and what we read in the news. Obviously Doria was the guide for this remarkable woman. And how lucky will those kids be to have grandmother Doria??? A number of sources/pubs are reporting that Anon 19:50. DM has an article saying it's "camera strobe" but it doesn't look at all like that to me. Wonder why it wasn't lined? I know in some places semi-transparent skirts are considered "trendy" but Givenchy? I liked the outfit alot--especially the more vibrant blues-- but didn't like that aspect at all. And I think that's something a real stylist would have caught. The press refuse to focus on the real target of the royal tour.They are looking for a scandal, but they are totally wrong,the skirt is OK. I am so sad for some people who refuse to accept the truth. It was definitely see through. And that's so disappointing to me. She needs to do better and a proper stylist would have made sure this didn't become a thing. And Regalia, I'm not sure if your comment is directed at me. But I'm definitely rooting for H&M. So I'm not refusing "to accept the truth" at all. Nor is it surprising that the press would focus on the fact that she wore a transparent skirt; it's kinda a big deal. Maybe not the point of the tour, but Meghan is in a new role and this kind of thing needs to be checked. Like when Kate had her skirts blow up and other issues, it seems so ridiculous because frankly we all know what these women look like! We all know they have legs and breasts and bottoms like other women, and we pretty much know what those parts look like. I understand that it's a shock at first, but it makes sense that Meghan would wear underwear, an I think the obsession is just silly. It has pleats that are a different color so when the light hits it it looks different. Regalia, I wear skirts with different colors too. None of mine show the shape of my underwear. It was see through. thank you Charlotte. Love these two!! Overall The tour has been a great success and lots of people have turned out to see them which (at least in NZ) they have not done for older members of the Royal Family in the last few years. It has been endearing to see their natural reactions and behaviour especially when meeting with children and young people. Some people have criticized her outfits, but personally I am not bothered by Meghan's choice of clothing, even when I don't like something. Everyone has their own personal taste and she definitely has preferences. She earned brownie points from me by wearing sensible weather proof items when it was likely to rain. However I agree with some other comments above, that the number of changes of clothing seems excessive for 16 days and didn't really fit in with Harry's presumed views on conservation and sustainability. I hope to see her recycling her outfits more often. Otherwise they are sending mixed messages and will inevitably fuel comments from trolls. Unfortunately, with Meghan’s pregnancy she’s not likely to be repeating many clothes past November. Coupled with the fact she’s basically worn 90% new clothes since her wedding, I expect we’ll be seeing a lot of critical posts and tabloid articles soon. I hope we will see some of her great coats from last winter at least. Annette, I agree to some degree. I enjoyed all of her outfits but I did feel like the constant outfit changes were a bit excessive. I hope she does make good use of these outfits in the future, otherwise it isn’t a good look. It was incredible seeing the crowds of people turn out to see the couple. They brought everyone together! Yes, there were too many outfits — for both Harry and Meghan. I’m thinking that is because the planners of this tour had the couple moving from several different venues in a single day. So, the different venues required different attire. I’ll need to look at a recap of the tour to know for certain. Wonder if 16 days is a record for a royal tour. How long have the others been? A huge thank you for you Charlotte. Following the tour was a delight, thanks to you. And this last post featuring a baby kiwi was another treat! Have a nice rest now, you must be exhausted too! LOL...just as we are telling Charlotte to take some R&R, Kate pops up unexpecteldly. Just as we are telling Charlotte to take a well deserved rest, Kate pops up unexpectedly today! No rest for the weary. First of all Charlotte, I am deeply indented to you. YOU HAVE THE BEST BLOG IN THE WORLD!! I wish I could give you an award as you are absolutely fabulous! I have your blog as my home page and it is the first thing I see when I log on! Thank you so much for your dedication, thoroughness and sacrifice over the past 16 days covering this tour! As far as Meghan's fashions....she did a fantastic job honouring Australian, New Zealand, USA and British fashion designers and jewellers! She gave us colour and neutrals. She is building a royal wardrobe from scratch and these pieces will be repeated for years to come. Princess Diana was quoted as saying 'the clothes are for the job". None of us has a role like Meghan"s where her clothes will be scrutinized as hers are. It is so easy to sit behind a computer and complain about how much her clothing cost. Well, if Prince Charles provide her and Harry with funds and a budget, it is up to them how it is spent. Kate spent a lot of money on clothes when she started out as well. She still does buying bespoke pieces in multiple colours. Harry hit the jackpot with Meghan. His dream of finding someone to take him on, do the royal job and create a family with has been fulfilled beyond his wildest dreams! I am sure I speak for many of us on here when I say that Charlotte deserves an award for her interesting and accurate reporting. These blogs are the best! Thank you, Charlotte. I don't remember how I found the duchesskate blog, but I've been reading you for years and have always enjoyed how informative your posts are. I'm a nut for jewels, not so much for clothing and shoes, but I've learned a lot about various designers from your blog(s). I was so thrilled that Harry found the woman "willing to take him on" and they make quite a team. And to echo those above -- thank you for these two wonderful blogs. And now, get some well deserved rest. You did a great job covering the tour and I hope you’re able to get some well-deserved rest now. I stopped commenting on the tour because honestly I couldn’t tell all the navy dresses apart and I was seriously disappointed in some of her choices- including this sheer skirt. And yeah, call me shallow but I like fashion and it’s the main reason I comment. I like royals and especially royal fashion. Yes, I know Meghan and Harry highlighted some important causes and I haven’t lost sight of that, in fact I think they did a great job, but the wardrobe choices left me puzzled and I’m still not a fan of the constant hand holding. It makes them seem like they’re more interested in each other, and I know that’s not what meeting new people is about. This is all my opinion, of course. I hope to see great things from Meghan in the future and I think I will. I just hope it’s not in yet another $2,000 navy dress that’s indistinguishable from the other 157 she has. A Royal Star was born before our eyes. Meghan’s grace, warmth, incredible ability to connect with people through her heartfelt speeches, and most of all her devotion and love for Harry bought tears to my eyes on so many occasions. Diana will be looking down on both her boys safe in the knowledge that they are BOTH the Peopl’s Princes ... and their wives are excelling in their Royal work. Our beautiful Princess will always be in our hearts, and I now feel so grateful that these incredible women are easing their pain, and keeping her great work alive as they live their own Royal journey. This tour has seen Meghan’s star soar in our hearts. She is the perfect life partner for Harry. He must be so, so happy..
I’m guessing they will have a short rest, and we’ll see W&K, H&M for Remberance day events. Thank you so much for all of your work on these blogs. The world seems scary and sad right now and getting to read these blogs is a real bright spot in my day. Thanks so much! My exact feeling... Charlotte's blogs are my escape, though I'm a granny. Thanks again Charlotte. I would like to stress too that being French I enjoy very much Charlotte's excellent English and choice of words. I found this blog in the beginning of the tour and I'm so pleased I did!! Love your coverage, Congratulations on a job well done! It has been a fantastic couple of weeks. I have learned so much following your blog. It really is very informative. Thank you so much for all the work you have done. It has been a wonderful read from start to finish. Thanks again Charlotte for all your hard work! I don’t know how you do it. Meghan did an incredible job on her first tour! 16 days, jet lag, new role an early pregnancy. I feel sick/exhausted just thinking about it. 70 outfit changes, so what? We don’t know how many of those clothes she had before and it’s early days as a royal. I loved this look. Contrary to popular belief the skirt is not see through. My boss met them today in Rotorua and she said it definitely was not see through at all. I’m disappointed people so easily lap up the media’s opinions on a photo with an unfortunate camera distortion. Congrats Harry and Meghan you both did splendid. I too, did not think it was see through - and with the explanation in DM stating it was the optical illusion, I could then see it was not see through. Wouldn't you think that her people would see that - Harry would see that, if it was see through. So many people behind her, helping her, would definitely bring it to her attention. Dear Charlotte, thank you for such marvellous work. It is always a joy. Although new duchess double the work? Thank you again. Donna. Thank you, thank you, thank you. I cannot tell you how much joy and delight I get reading your blogs. A bright spot! Your two blogs are my favorite pass time! This tour has given me new appreciation for the duchess of sussex. It must have been very demanding and to do all this under scrutiny and pregnant! wow! She is a very dedicated, hard working individual. I wonder how they managed to leave the country with no pictures taken. Their fleet of cars was filmed driving into a secure area at airport that has no public access. Their convoy of cars was filmed driving into a secure area at airport that has no public access. Their convoy was driven into a secure area of airport that has no public access. Sixteen days already! Wow, thank you for the wonderful coverage of this tour! It's distressing that the world's media have all 'jumped on the bandwagon' to mar Meghan & Harry's last tour appearance by claiming her skirt is see-through. Looking at the many photos on this blog it is obvious that the sun shining on the fabric gives it a sheen that is not there in photos where the sun is not shining on the skirt. Any journalist not looking for a sensational story could have determined that easily. Fabrics react is various ways and some, when stretched, pick up light differently. Meghan's skirt was not see-through and she did not have a "Diana moment" as some sources are claiming. I just wanted to share my opinion as I don't think the media is being fair to Meghan. Thank you again Charlotte for the wonderful job you did covering this long tour. You went above and beyond your usual fantastic posts to keep us current on what was happening half way around the world and most times before the media outlets had it posted. Great job! I have seen those pictures, and the skirt is definitely see through IMO. Of course the tabloids are going to jump on that. Wonder what would happen if skirts blowing up, blouses sipping down, light shining through clothes, etc., were just ignored, like they are in "real life"? Charlotte, you did an amazing job covering the tour. Well done and thank you for all of your hard work!! Meghan's changes of wardrobe in a single day should be viewed in the context of the great variety of events in a single day. Some have wondered why she wore two different dresses on the last day in Rotorua. I've been thinking about that, and to my mind, the Maori ceremony was quite special and she may have chosen that dress specifically to work with the ritual. It worked wonderfully well with the cape. She changed into something different for the walkabout in order to preserve the specialness of the Maori ceremony, if that makes sense? Later, she switched out her skirt for jeans, keeping the top, changed her shoes, and borrowed Harry's jacket for the forest walk. That change was completely necessary. I read in People that there were 40 different outfits---that seems reasonable considering there were 76 events. Charlotte, I want to thank you for the work you've done following the tour. The posts were all accurate, informative, full of details and beautifully written. I've learned a lot and had a lot of fun. Sei veramente bravissima! I wish to thank you, Charlotte, for posting all of this. It has been a pleasure and a joy to read the blog, and I have greatly appreciated all the effort and vast amount of information you have provided us with. I don't know how I found your blog about Meghan, but I'm so glad I did. You have taken us along on this marathon tour, educating us about the historic and current significance of each stop. The photos you chose allowed us to see Meghan’s intelligence, warmth, charm and humor — and her talent as a public speaker. I am exhausted from taking it all in, as I’m sure you are from presenting it, and as Harry and Meghan must be from living it. I have loved Meghan since I first heard her name in Harry’s plea that the media leave his girlfriend and her family alone, when I watched her interviews and speeches on youtube and read as much as I could about her. I defended her then as the perfect mate for Harry to those who questioned her motives in their protective feelings toward him. I’m so happy that the whole world now sees their incredible compatibility. Harry is so right that they make a great team. I thought they looked particularly relaxed and triumphant as they walked hand in hand under the Redwoods. They had completed what they set out to do -- 76 events in 16 days. What an accomplishment, and what a success! They have been a warm, bright light in our dark world over the last 16 days. I will miss them. But I will have these pages to return to when I want to see their smiles. Charlotte, thank you so much for your wonderful writing, your thorough research, your choice of photos that allowed us to see Meghan and Harry for the charismatic, compassionate people they are. You have been heroic, and deserve some kind of reward or medal. Hopefully all these appreciative comments will suffice in some small way. R, you said it perfectly. I fell in love with Meghan when I started to read about her and am also glad that the world can see her now. Thanks to Charlotte, people can read positive, truthful accounts. I wish Meghan the best of everything and hope she gets plenty of rest now. I heartily endorse everything you've expressed so beautifully, Anonymous 20:39! I agree with Harry---give Meghan anything she wants. Charlotte- thank you for the wonderful coverage of this tour! It was a special treat to come to your blog each day to read about the tour and I was so impressed by all of the work you did! Dear Charlotte, I am a long time reader of Duchess Kate and now I am thrilled to enjoy your Mad About blog too! It is a joyful part of my daily routine to check each blog for posts. I skim mainstream news often to keep in touch but I devour each word of your blogs carefully digesting each fact and opinion. It is such a pleasure to read. You spend so much more time and effort on the causes the royals wish to highlight and I always feel uplifted and inspired after reading which is almost never the case with other news. That is why when I see things like "Charlotte, your blogs have gotten me through some tough times personally." I can honestly say I get it! I think there is something lacking with our leadership and the press worldwide where people forget to inspire the souls of those whose attention they have a responsibility to educate and the sense of community is something lacking as well. You engage me fully with your writing. I am an American who is fully committed to the principles on which my country was founded, meaning I don't believe that the right to lead a people should be based on birth as is the case with any monarchy, however I have come to appreciate deeply the roles this particular royal family have taken on and their example of service to some very worthy causes is what severely lacking in our elected leadership worldwide. You have cultivated a unique community here and I am grateful to be a part of it. My comments on this trip after seeing what others have said are as follows...before we judge Meghan's choices as far as fashion goes I think it's extremely important to take a step back and look at the trip as a whole. While some have said her choices seem boring, repetitive or bland, I would prefer to say she was professional. She attempted creativity but always deferred with attention to her role and her place in each event and never overshadowed her husband, the people they met or the causes that were being highlighted. Yes, through her warm personality and even her beauty she draws extra attention to these subjects I think she achieved an almost impossible goal of bringing her game but not becoming THE game. If that makes sense? She is amazing and again as an American I could not be more proud. Please also dear readers remember that as she shines a light in the world it is SUPER important that this woman be very careful not to outshine those who outrank her in her new home. I admire Princess Diana greatly but I do feel she might have better served her family and her country sometimes by not always stealing the limelight quite so much.I think both of her daughters in Law do a tremendous job of balancing that and we should praise them, not condemn them for their achievement in that area. Thank you Charlotte for your hard work and positivity! Well done, Charlotte!! Thank you for your impeccable work covering the tour. You amaze me. 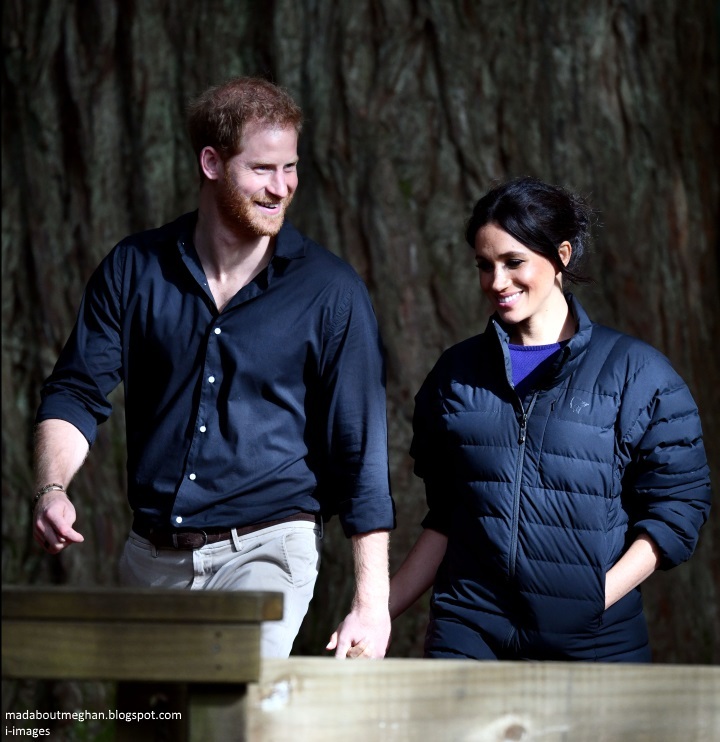 I've just been looking at Harry's instagram picture of Meghan wearing his jacket and standing among the Redwoods, and it is an absolutely stunning shot. It shows the majestic trees, sunlight behind Meghan, lit path in front of her, and wonderful moment of her smiling at the photographer, Harry. What a moment to capture! Thank you Charlotte for this wonderful blog. It is informative, unbiased, uses beautiful pictures and fast. You deserve a long break same as Meghan and Harry. I have to comments to make regarding Meghan’s fashion. I don’t think 40 outfits, per People magazine, for 76 events is excessive. It turned out 2 outfits per day. Some days with very warm weather and completely different events requiring different styles of outfits. As for Meghan wearing muted colors and lots of navy blue dresses, she chooses her outfits to complement Harry’s clothes. She’s mindful not to overshadow him since their engagement. Because Harry wears navy often, I don’t think Meghan’s choices will change. Thankfully, Harry has been wearing more greys and browns. I’m looking forward for the next event. Hopefully it’s not too long a wait. Thank you Charlotte for your amazing coverage of this royal tour. Such a great tour with so many amazing events showcasing so many great causes.I think Harry and Meghan have done the royal family proud. For the fashion I think she saved the best for last the blue skirt with the different shades is just beautiful.